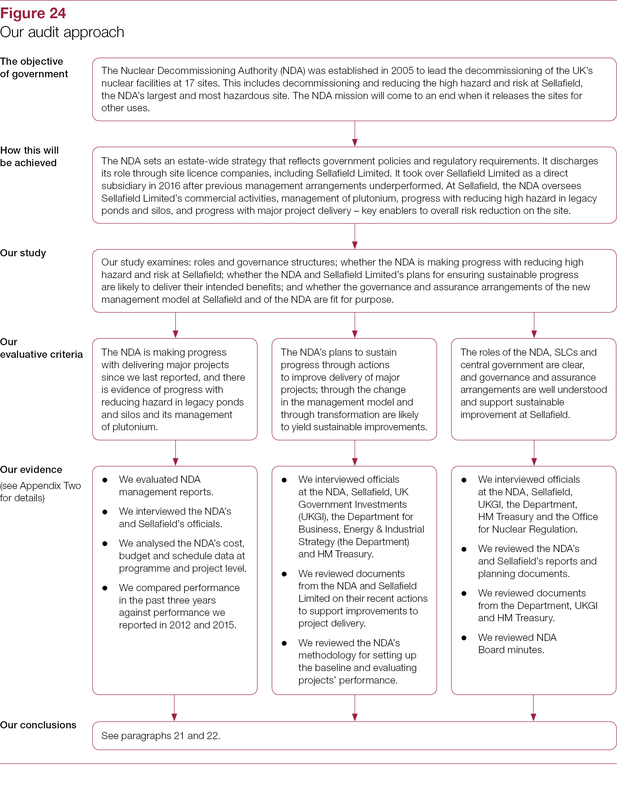 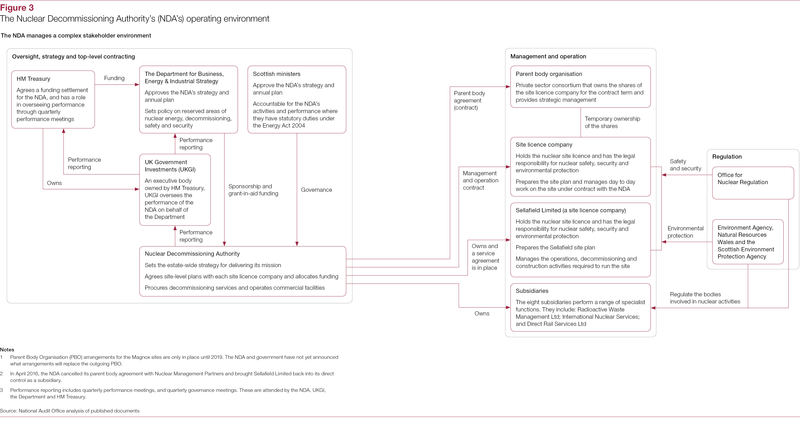 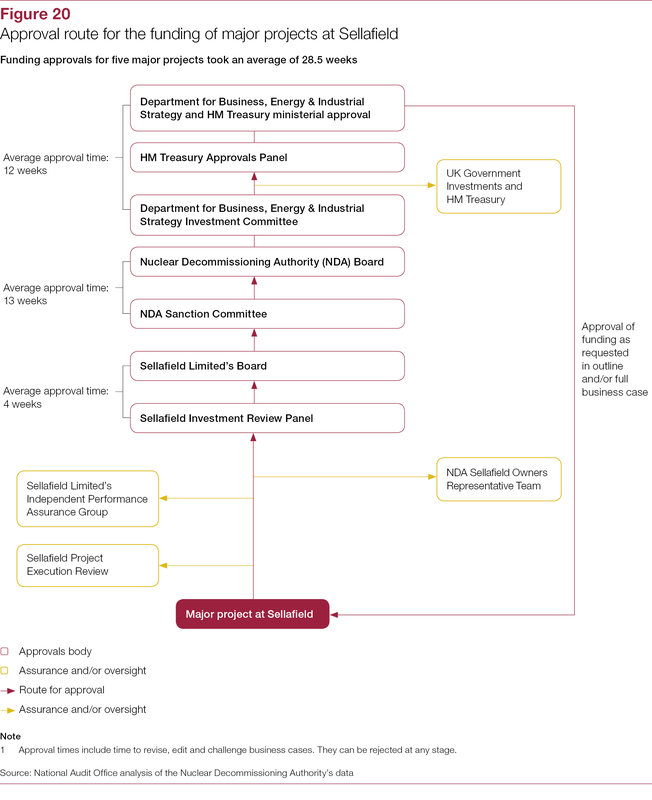 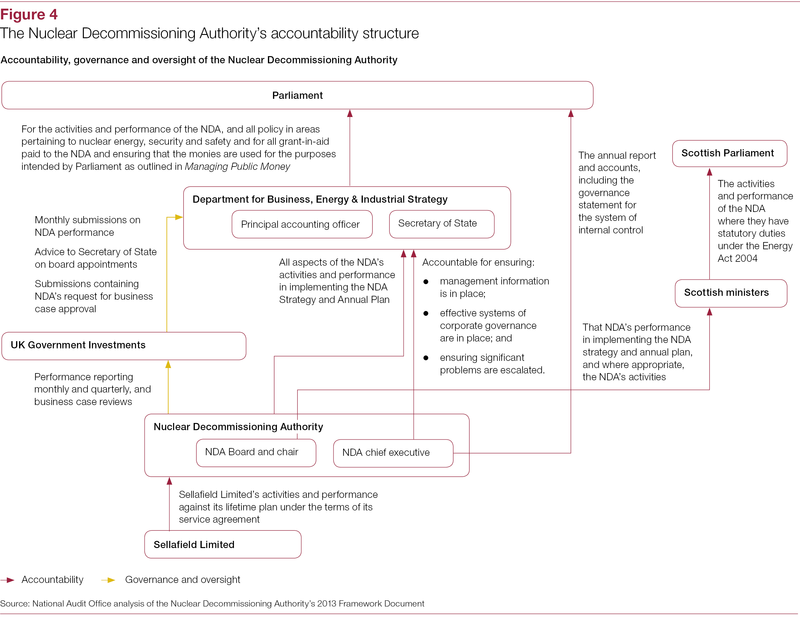 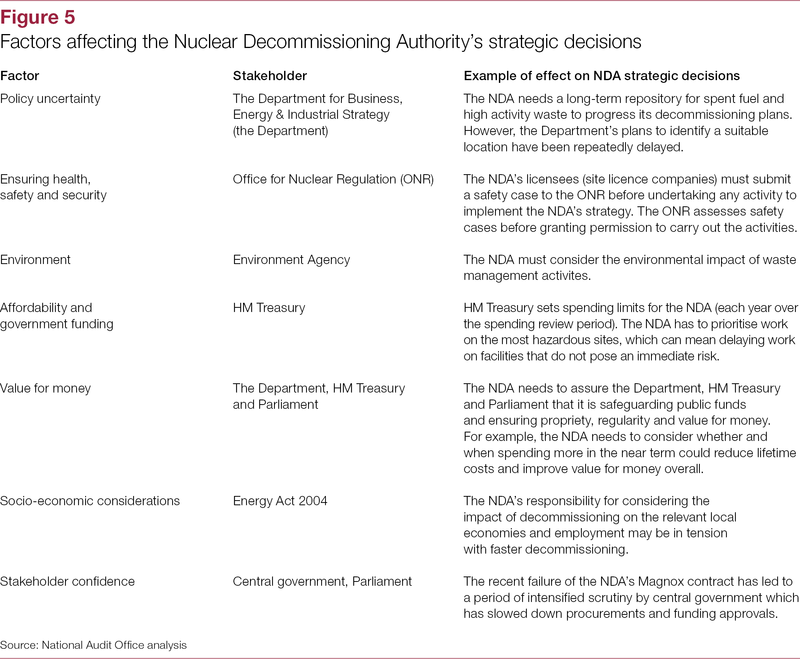 The Nuclear Decommissioning Authority (NDA) is responsible for operating, decommissioning and cleaning up 17 nuclear reactor and research sites in the UK. 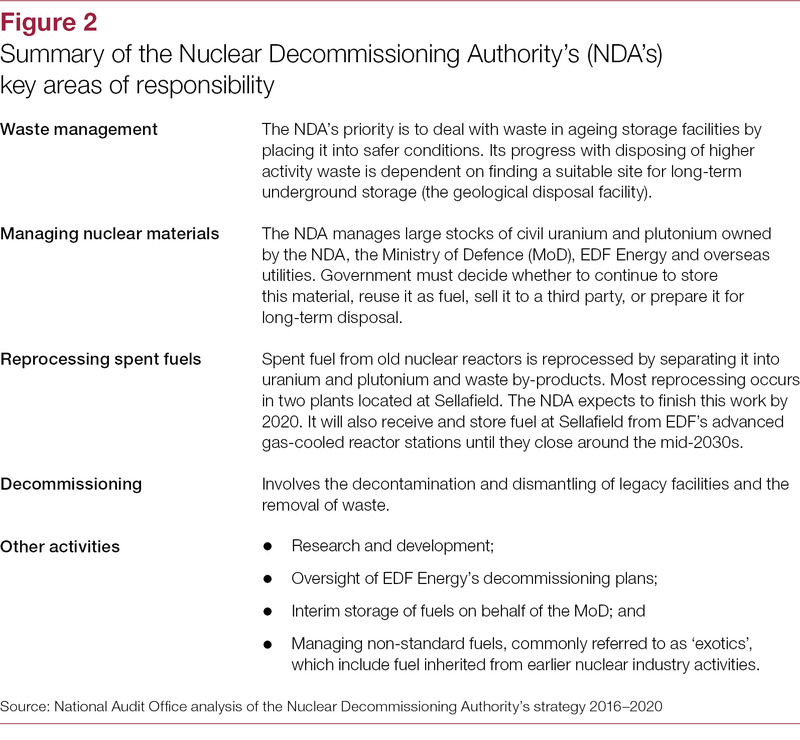 The NDA’s work includes reprocessing spent fuel from old nuclear reactors, managing and storing nuclear materials, removing and managing contaminated waste, and decontaminating and dismantling legacy facilities. 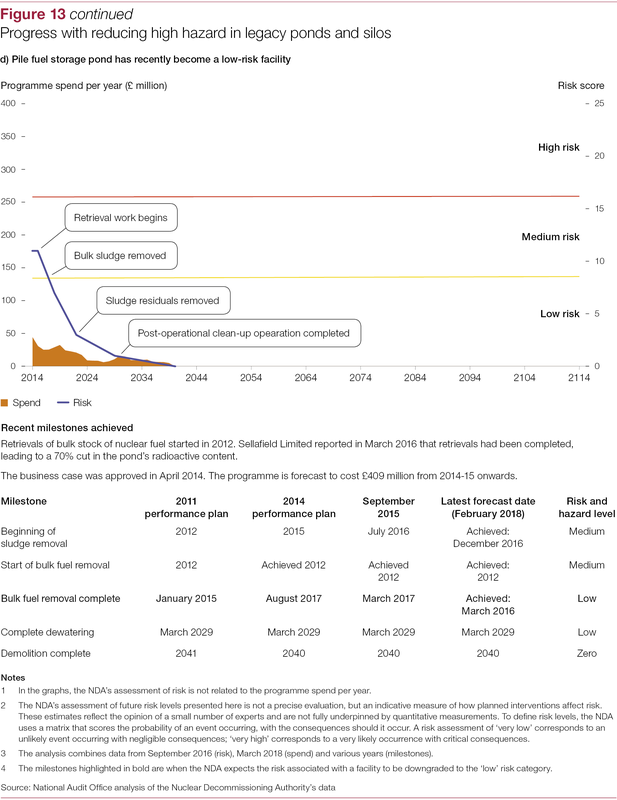 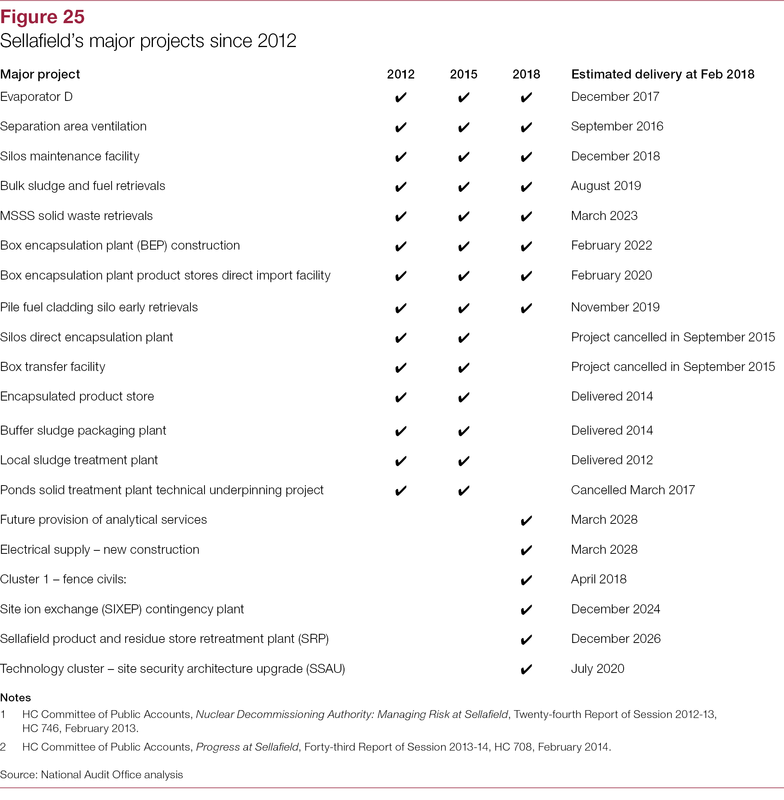 The NDA estimates that this work will be completed by 2120, at a cost of £121 billion, but these estimates remain highly uncertain. 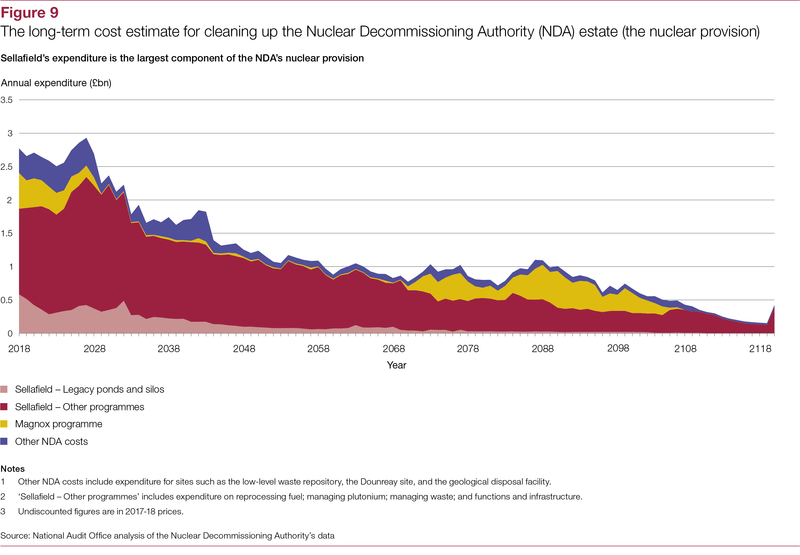 Sellafield is the largest and most hazardous nuclear site on the NDA estate, accounting for 75% of the long-term cost estimate. 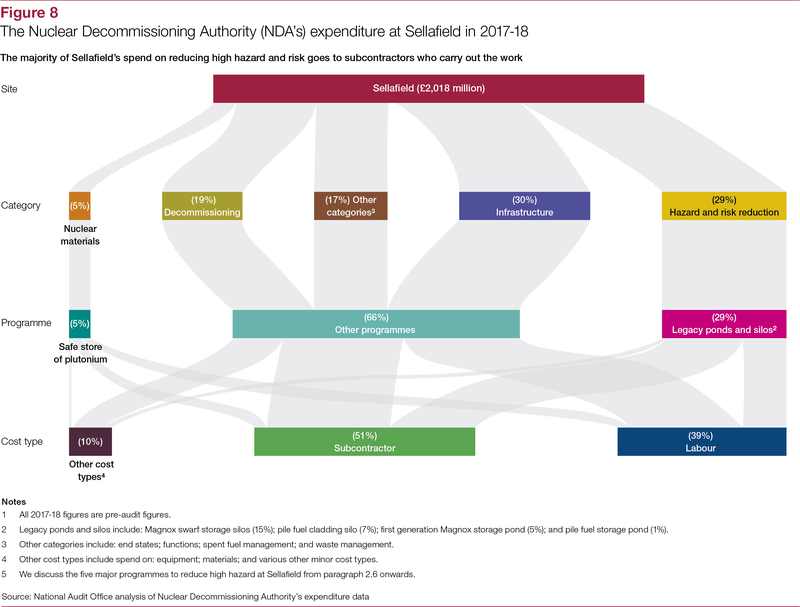 Sellafield accounted for 61% of the NDA’s total spend of £3.3 billion in 2017-18. 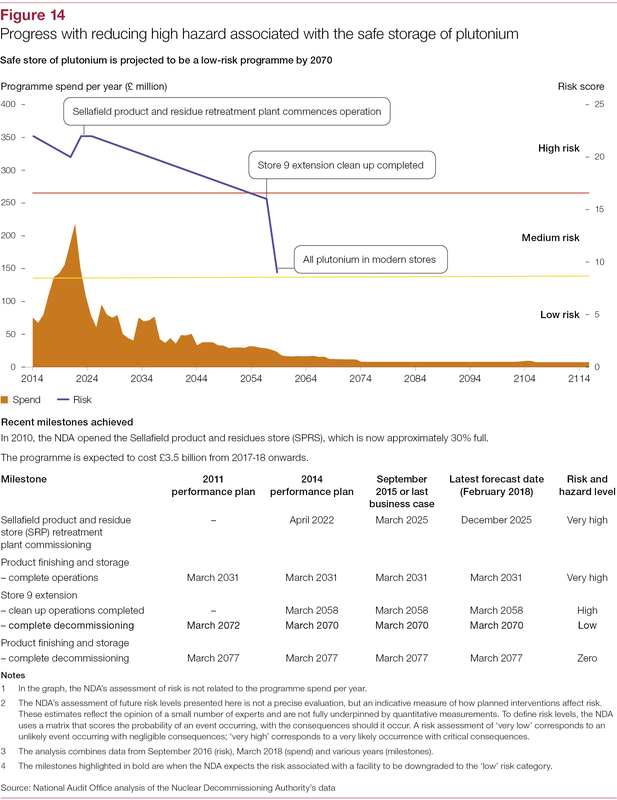 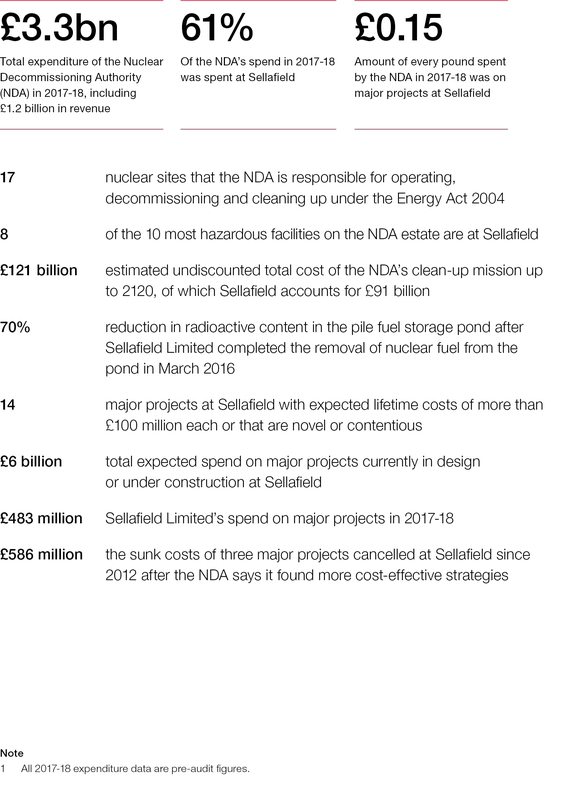 We have previously reported on the NDA’s progress with reducing risk and hazard on the Sellafield site and found that the NDA had struggled to understand the full extent of the work necessary to clean up its most hazardous facilities. 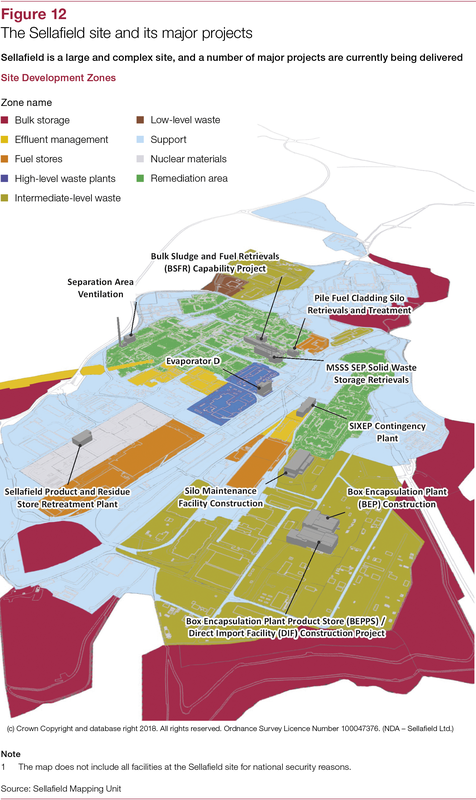 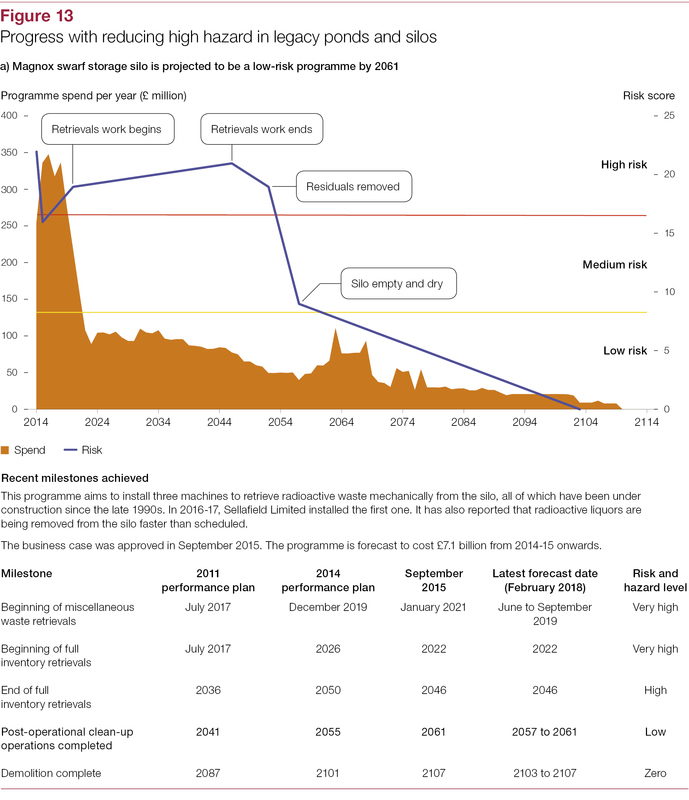 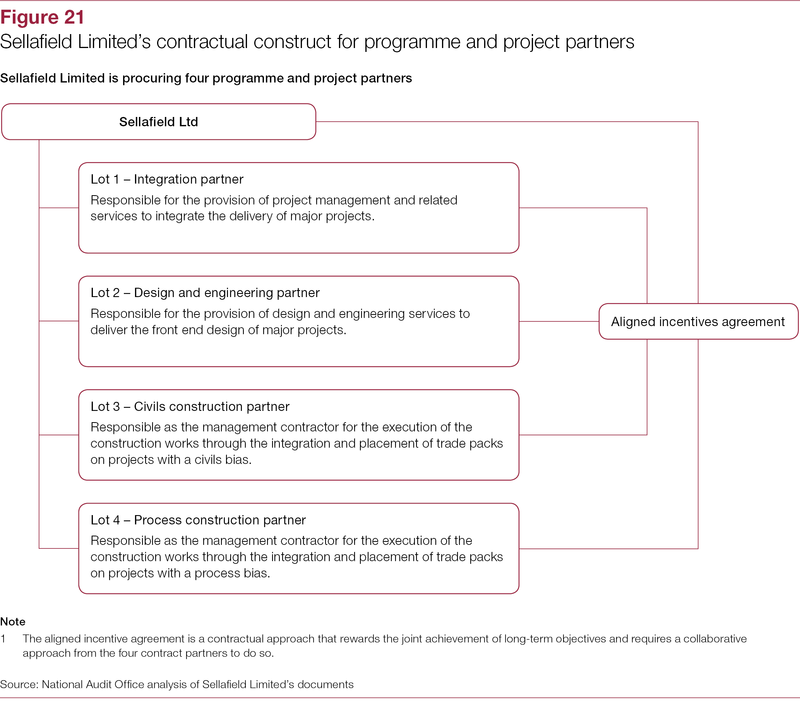 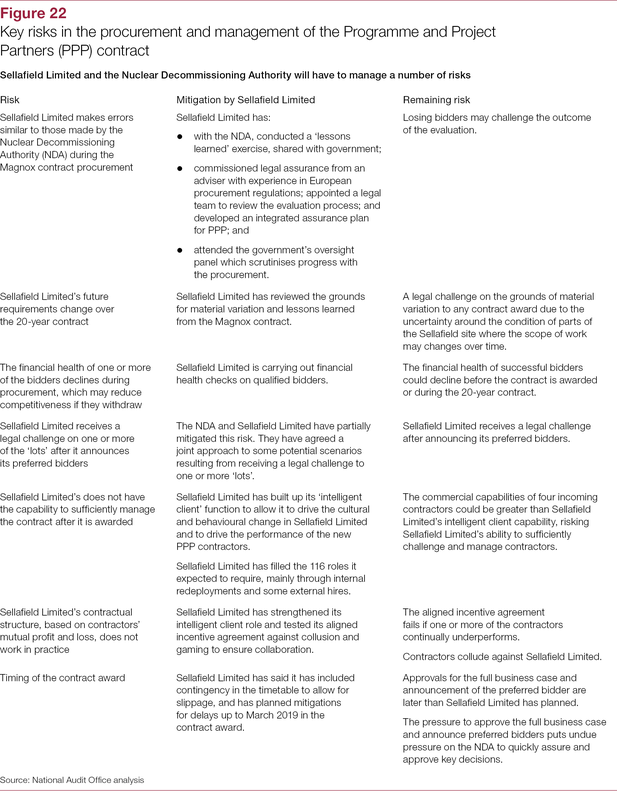 the NDA and Sellafield Limited’s plans to ensure sustainable progress at Sellafield (Part Three). 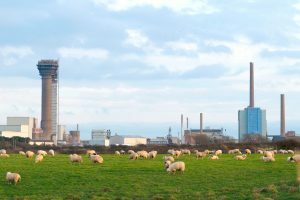 Since our last report in 2015, work to reduce risk and high hazard at Sellafield has taken an encouraging turn for the better. 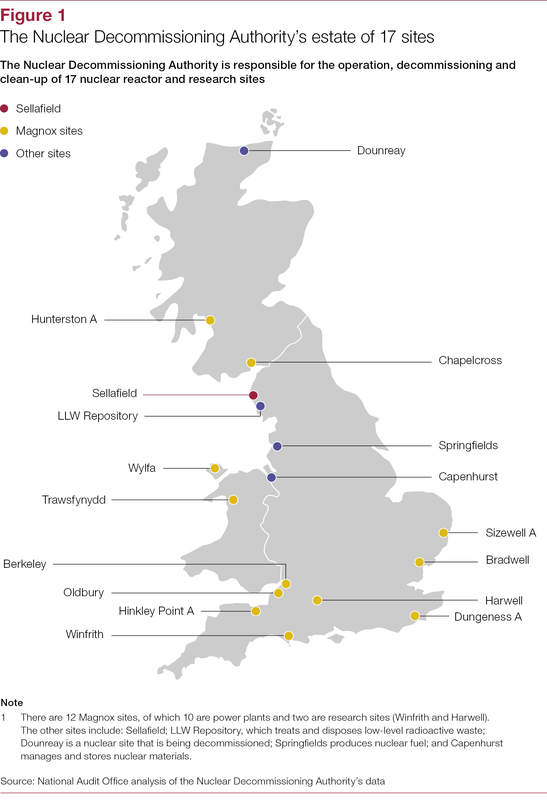 In recent years, Sellafield Limited has met significant milestones in retrieving hazardous waste from its legacy ponds and silos. 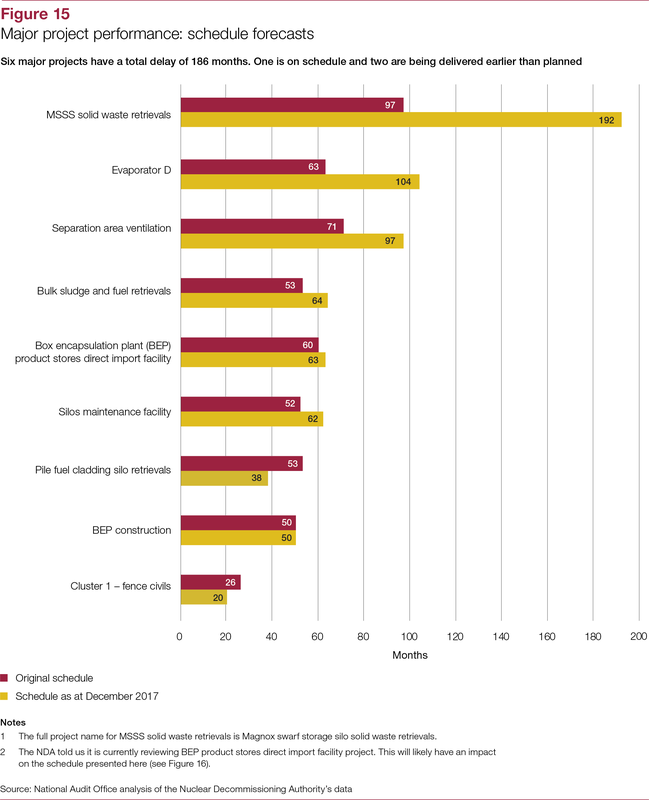 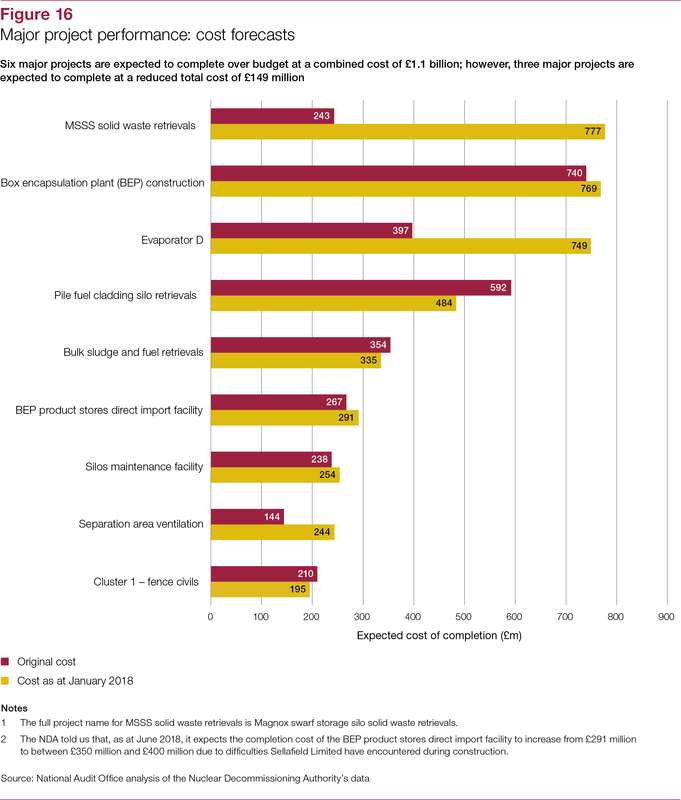 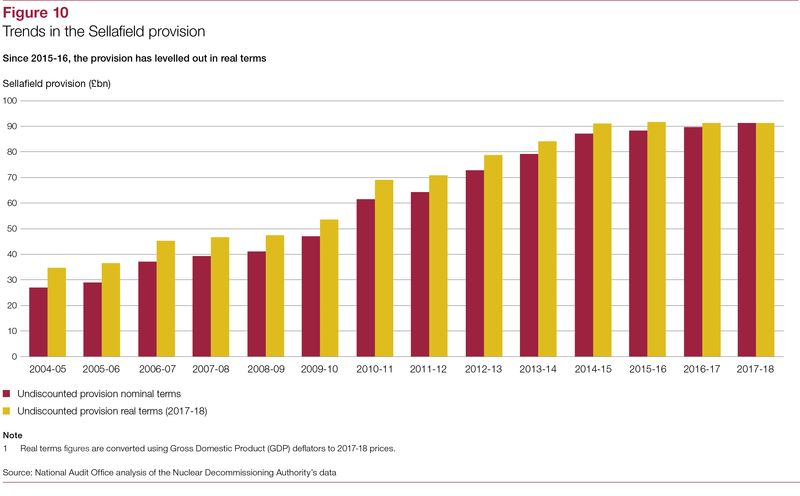 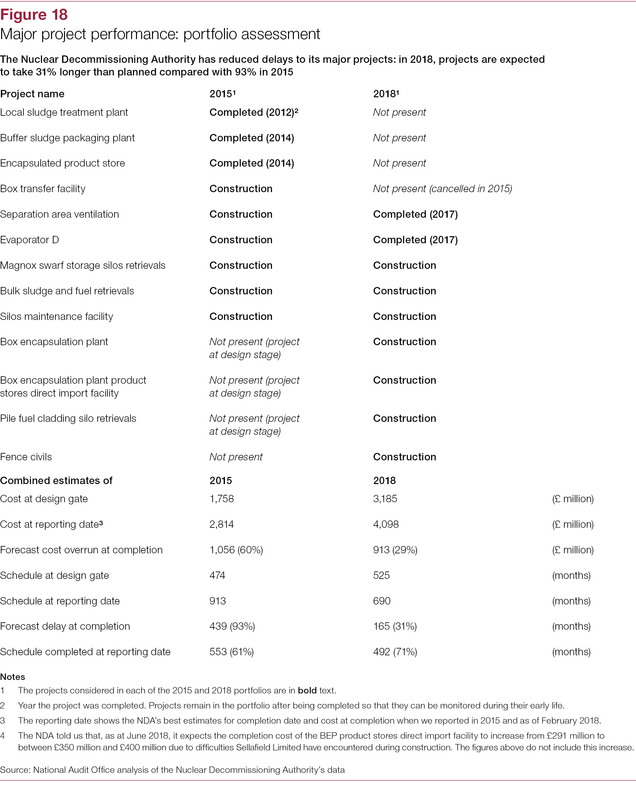 While delays and cost overruns are still evident for major projects at Sellafield, the NDA has made progress with reducing these since we last reported. 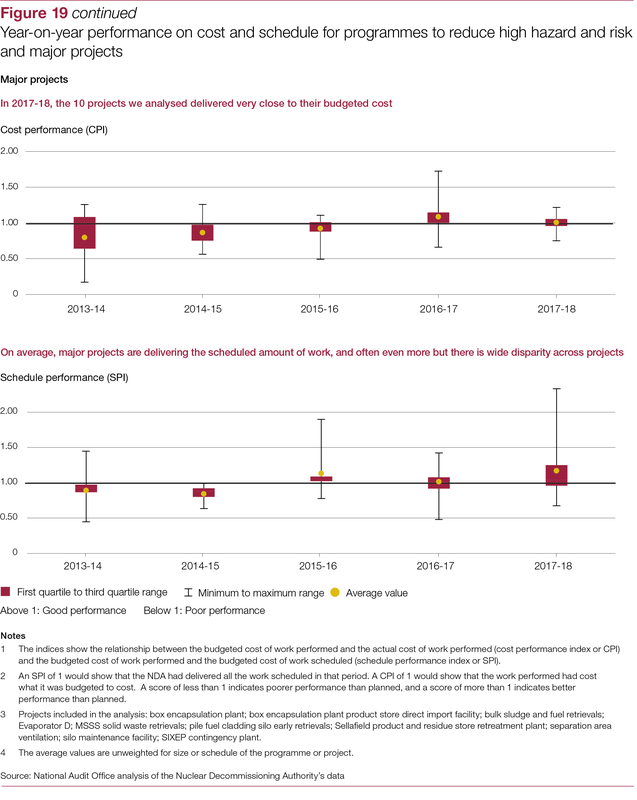 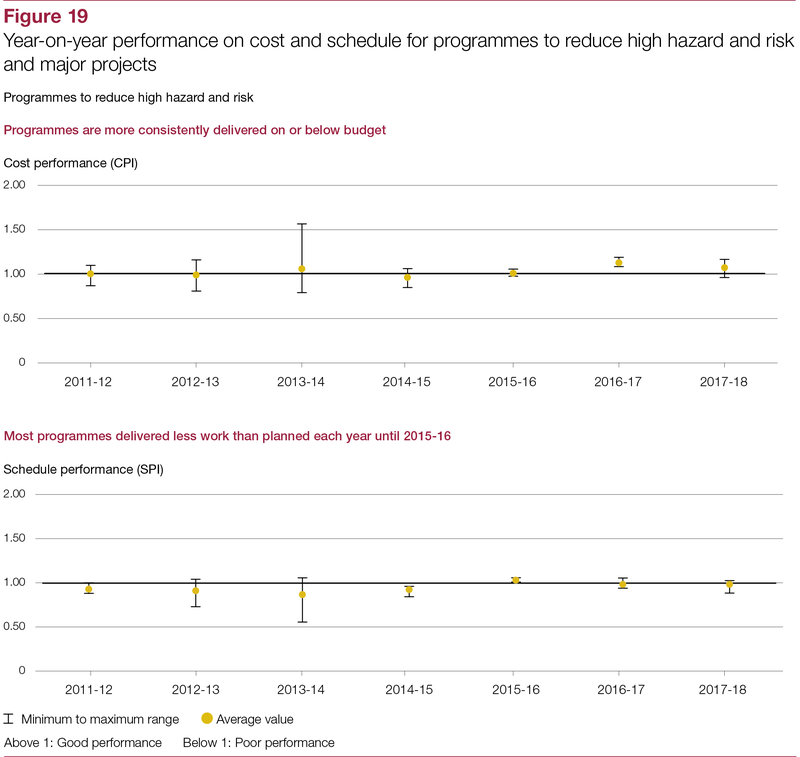 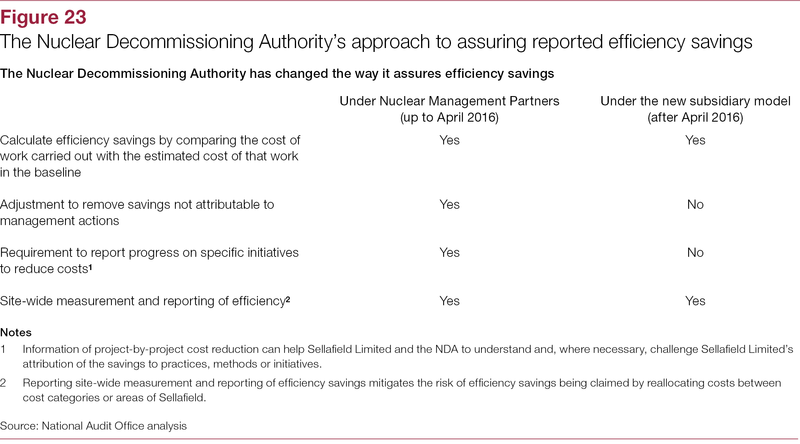 However, the Department for Business, Energy & Industrial Strategy, UK Government Investments, the NDA and Sellafield Limited have more work to do to measure, evaluate and communicate progress more effectively. 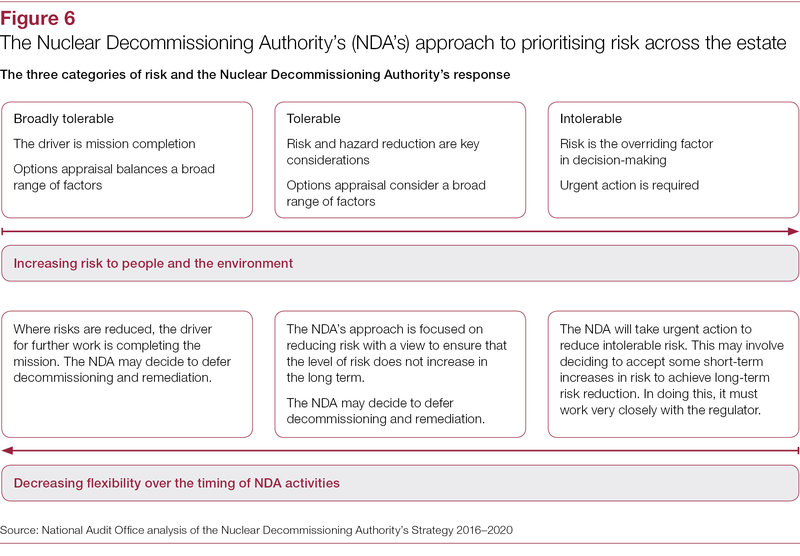 To sustain progress in the near term, the NDA and central government will need to clarify the NDA’s role and to find the right balance between scrutinising decisions and enabling the leadership at Sellafield to exercise its legal duties, professional expertise and maintain motivation. 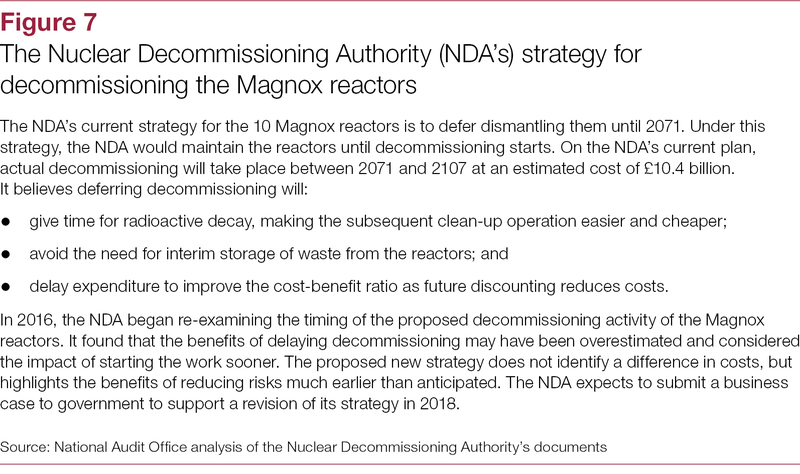 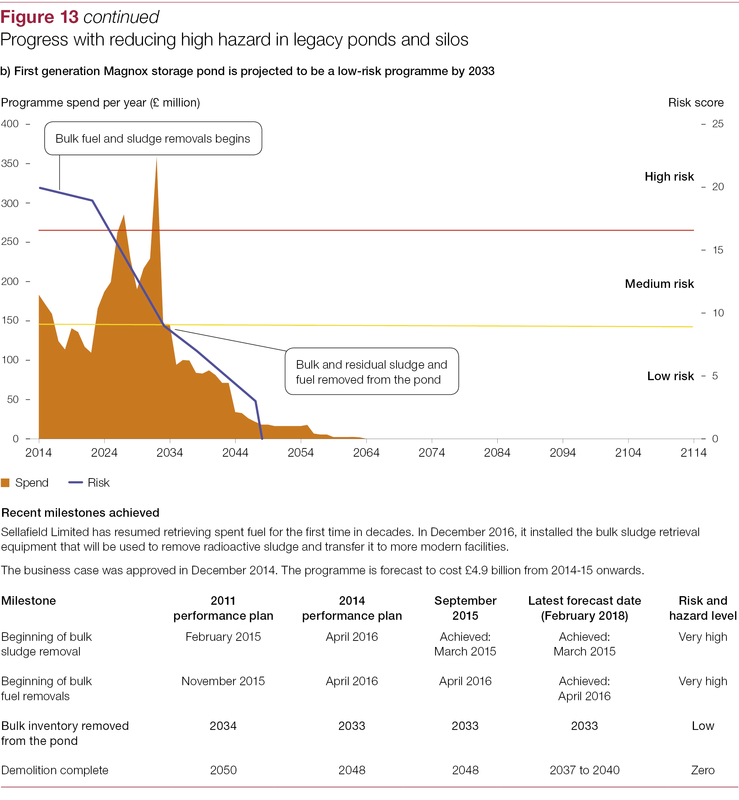 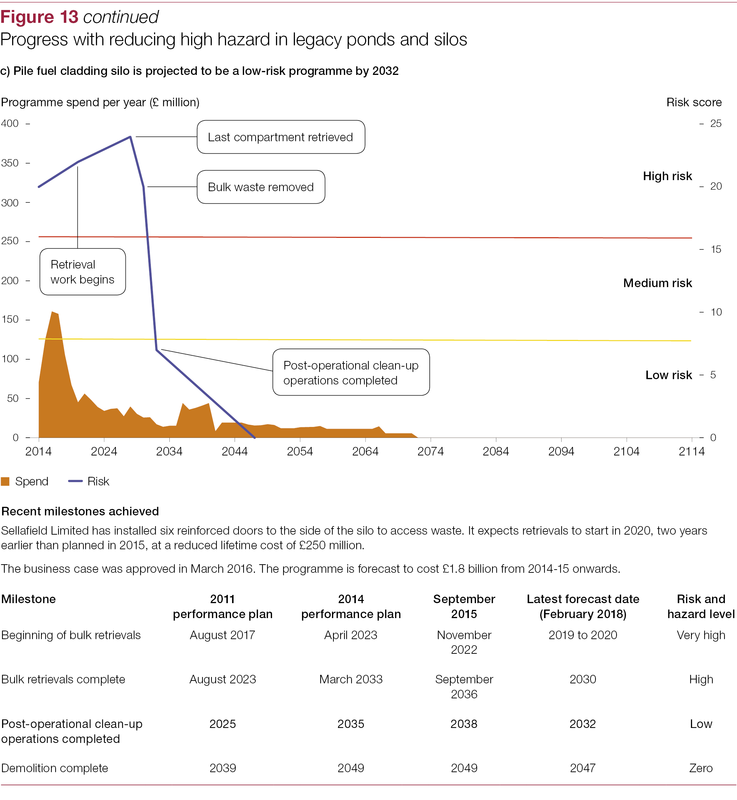 To inform its longer-term strategy, the NDA must review the constraints that it says prevent further and faster progress with reducing high hazard at Sellafield.